I approach performing as an entirely separate project from creating finished compositions. When I'm composing, I'm a perfectionist. I'm ruthlessly pursuing the sounds and structures I'm interested in, and will revisit details again and again until they feel just right. I don't find it interesting to perform by simply playing back the sounds I discover during my composition process. I want a performance to have more life, more dynamism, more danger than would be possible if I had the same perfectionist approach to sound that I have while composing. Instead, I approach performance as a much rougher, sloppier thing. I use techniques which allow me to have a huge amount of real-time control of the sounds I produce. I throw these sounds around the room I'm in, listening to what sounds good on the sound system, paying attention to what feels right for the vibe of the room. I trade compositional sophistication for spontaneity, the pure pursuit of the ultimate sound for the pursuit of the best sound for here and now. I've played in a bunch of different countries, and a number of cool festivals. I seem to be lucky enough to at the point where people will fly me somewhere and pay me to play now and then. This is a great privilege. Here is an example of what you might hear at a Morgan Packard performance. Over twenty-five years of creative exploration, Morgan Packard has immersed himself in jazz saxophone, dj culture, abstract digital audiovisual performance, crowdsourced algorithmic sculpture, software engineering, and digital interactivity. Across all of the media and genres he works in, he is particularly interested in qualities of repetition and self-generation. As a laptop musician, he has performed throughout the US and Europe, at festivals like Boulder’s Communikey, Montreal’s Mutek, and Serbia’s Dis-Patch. His music has been played by famous DJ's and featured on NPR's All Songs Considered. He co-wrote the pioneering music/visuals app Thicket, which has been downloaded more than a million times from the Apple App store. Monday through Friday, Morgan builds museum exhibits and other immersive, high-tech environments as a programmer/designer at Cambridge’s Small Design Firm. Thicket is an iPad/iPhone app made in collaboration with Joshue Ott. Thicket is available on the Apple App Store. Mesa Sequencer is an iPad/iPhone app made in collaboration with Jay Ahern and Maike Verloh. It is an interactive version of the Mesa Sequences EP, by myself and Jay Ahern. Mesa Sequencer will be available on the Apple App Store on October 4th, 2012. Tonic is a pure C++ synthesis audio synthesis engine I designed and built with the super-talented Nick Donaldson. Tonic is a collection of code designed to be embedded inside any C++ application. It's beautiful, easy, and fun to work with. LATTICE WORK is a participatory sculpture project combining elements of simplicity, community, and scale, to give people the hands-on experience of creating a large crystalline structure from nothing more than recycled 8 1/2×11 printer paper and scotch tape. LATTICE WORK engages people of all ages and abilities in a communal and creative effort. LATTICE WORK participants gather in a comfortable, conversational space to construct the fundamental building blocks. 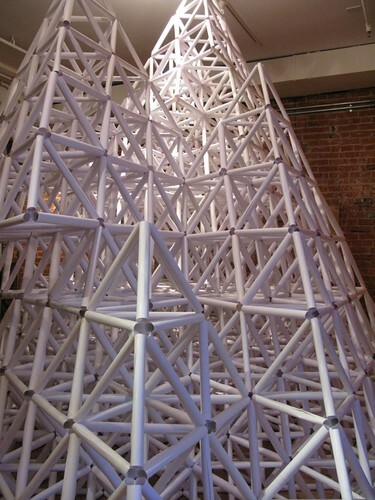 They roll and tape the paper into tubes; the magic begins when six tubes are joined at the ends to form a tetrahedral pyramid. As the work progresses, each pyramid finds its place in the growing crystal structure, which expands quickly into a large geometric array whose size is limited only by the space in which it is built. LATTICE WORK is an homage in equal parts to Buckminster Fuller and to the early American quilting bee; to rigorous mathematical thought and to the convivial pleasure of craft.